The control area is similar, with some variations, for archival descriptions (ISAD, DACS, and RAD templates only), authority records, archival institutions and functions. It contains fields that uniquely identify the description itself and records how, when, and by which archival institution the description was created and maintained. The following notes aim primarily to clarify AtoM procedures; for guidelines on what information to record in particular fields, consult the relevant content standard. Users may note that the AtoM templates offer more fields than exist in the content standards, which originated from an effort to harmonize the templates with all four standards. The notes are organized by field, with links to the applicable section(s) of the standards. Where there is a one-to-one correspondence between a data element in the standard and an AtoM field, the note simply gives the standard rule verbatim. If you are using the reference-code inheritance option available in Admin > Settings > Global (learn more here), the Institution identifier you have entered on the ISDIAH archival institution record will appear as part of your inherited reference code. If you are not using the reference code inheritance, this field offers users a way to record the related repository identifier with an associated archival description. Administrators and editors can customize the taxonomy to match institutional standards if desired, adding new terms, or changing/deleting the default terms. For more information, see: Terms. AtoM implements this data element as two separate multi-value fields. The value lists are based on the ISO standards and cannot be edited. Click on the desired field and begin to type the name of the language or script. AtoM will auto-suggest as you type. When the correct name appears in the field, click on it to add. There is no limit to the number of languages or scripts you can add. To remove a language or script already added, hover your cursor over the bullet next to the language/script. The bullet will change into an X - if you click the X, the language or script will be removed. To record a narrative note relating to either field, use the Maintenance Notes area (this field is not available in the archival description edit templates). These fields are intended to capture information about the language of the description, rather than the language of the materials themselves. For archival descriptions, there are already fields available in the edit page to capture information about the language of the materials being described - in the ISAD(G) template, these fields are found in the Conditions of access and use information area; in the RAD template, these fields are found in the Notes information area; in the DACS template, these are in the Conditions of access and use elements. For further information, see the section on Data entry for each specific edit template. “Record relevant information about sources conslulted in establishing or revising the description.” DACS 8.1.3. Note that this field is labeled “Sources used” in the DACS template. This is a text field; AtoM does not structure the data in any predetermined way. This element appears in the templates for authority records, archival institutions and functions. For archival descriptions see Archivist’s notes, below. “Record the name(s) of the person(s) who created or revised the description, as well as the creation or revision date.” DACS 8.1.5. 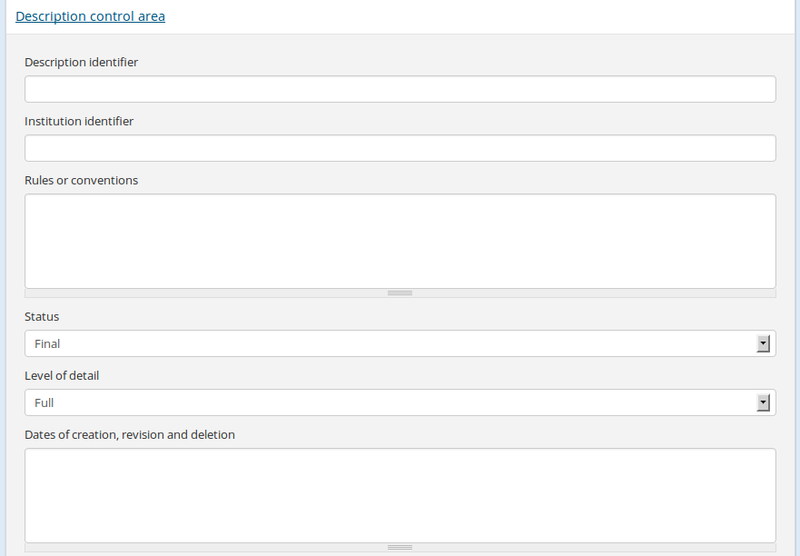 Note that this field is labeled “Archivist and date” in the DACS template. This element appears only in the ISAD(G) and DACS archival description templates. This is a text field; AtoM does not structure the data in any predetermined way. There is no limit to the number of notes you can add.